Context: BRT as a mass transit option in Asia? Bus Rapid Transit (BRT) aims to provide a subway-like level of service and speed, but using buses rather than fixed rail trains. BRT systems are especially appealing to cities which are rapidly growing, because they are more than 10 times cheaper than subway systems to build and operate, and can be built much faster. BRT would seem to be a natural fit for rapidly growing cities across Asia. However, although BRT has been expanding worldwide, up to early 2010 Bogota's TransMilenio BRT system from 2000 was still the only 'very high capacity' BRT, and BRT in Asia was becoming entrenched as a kind of low to medium capacity niche transit mode rather than a true mass transit alternative. 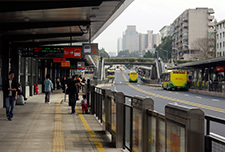 The Guangzhou BRT opened in February 2010 after the conceptual design starting in late 2004 through detailed engineering design in 2008 and construction in 2009, and was the first (and as of 2017 still the only) BRT system in Asia to achieve metro-replacement levels of passenger capacity and throughput. The system averages 800,000 passengers per day, and together with Bogota's Transmilenio is the only BRT system worldwide to carry more than 25,000 passengers per hour in a single direction, which is higher than most metro and all light rail lines worldwide. 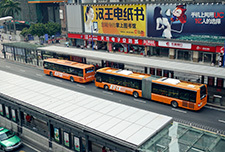 Guangzhou's BRT pioneered very high capacity 'direct service' BRT in which BRT buses enter and leave the BRT corridor without passengers needing to transfer. 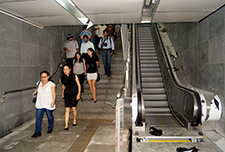 The stations were designed to accommodate regular 12m buses as well as larger 18m buses. This article briefly explains the history of the project and the role of various experts and key personnel, as well as explaining how the project was achieved and some of the many obstacles that had to be overcome. For basic data about the system including a system map, photos, and performance data and other details, refer to the links provided above. Conditions for all road users were dramatically improved with BRT, including bus passengers, pedestrians, car users, and cyclists. Top: normal conditions even during off-peak hours before BRT implementation. 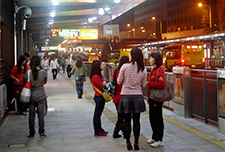 Above: Gangding BRT station in 2010. 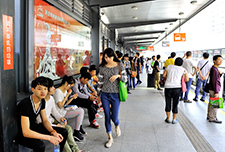 Passengers wait for buses in Zhongshan Avenue, before BRT. Passengers wait for buses at Gangding, before BRT. As well as bus and traffic speed improvements, conditions for waiting bus passengers were greatly improved at Gangding and along the BRT corridor. 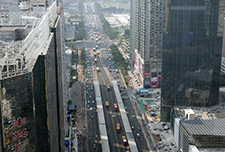 Far East Mobility experts provided key inputs at all stages of the planning, design and implementation of the Guangzhou BRT, and led the project during the conceptual design, engineering design and construction phases, as well as preparing proposals for optimization and improvement after the system commenced operation. The key experts involved in the BRT planning and design are listed in the following table. This list includes the key technical experts but does not include many government officials who played very important roles, most notably the following, with positions listed at the time of the BRT opening in 2010: Lu Yan (Vice Director of the Construction Commission), Su Zecun (Vice Mayor, in charge of construction), Xian Weixiong (Director of the Communications Commission), Zhang Guangning (Guangzhou Mayor during 2003-2010), Guo Sheng (Vice Director of the Traffic Improvement Leading Group Office), and Ran Shende, vice secretary general to the vice mayor. Walter Hook, Principal of BRT Planning International, foresaw the potential of the Guangzhou BRT from an early stage and provided technical and fund-raising support to enable the work of the technical team, including during the most difficult times when the project was barely moving during 2006 and 2007. Shenyu Belsky of the Rockefeller Brothers Fund and Joe Ryan, then at the Hewlett Foundation, also foresaw the Guangzhou BRT's great potential and provided sustained support even during the most difficult times, including when many philanthropies in the field of urban transport in China were dismissive of the power of individual projects and cities to make any difference, and were fixated instead on the chimera of 'national policy'. BRT corridor selection. 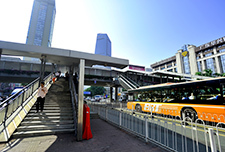 The city initially wanted to implement BRT in a peripheral corridor as a kind of test, but the technical team convinced them to implement the system along Zhongshan Avenue, where it would have the maximum benefits. The team also did preliminary designs for proposed Phase 2 corridors. Road and intersection design, for all difficult points along the BRT corridor and for all road sections at and between stations. Xiaomei Duan and Su Zhuojun led the work on road and intersection design, working with Pedro Szasz. BRT station dimensions, number of substops, location relative to intersections, configuration, architecture and operation. The team also defined the route allocation amongst the substops in each station using a database application specially developed for this and other BRT planning and design tasks. Derek Trusler provided key inputs to the BRT station architecture and shaped the design. BRT operational mode. The Guangzhou BRT’s revolutionary combination of very high capacity with a direct-service operational mode was developed by the core technical team, with Pedro Szasz, Karl Fjellstrom and Xiaomei Duan convincing the city to use this operational mode rather than a more traditional (especially considering the very high passenger demand) trunk-feeder model. The system does not have any transfer stations or terminals. This operational mode is having a worldwide impact, as new BRT systems now increasingly favour direct-service over trunk-feeder operations. Morning peak origins and destinations for trips using the Guangzhou BRT, as modelled during the operational design. Only around 10% of trips using the BRT corridor are from one BRT station to another. The other trips using the BRT corridor are from inside the BRT corridor to somewhere outside the BRT corridor, from outside to inside, or from outside the BRT to somewhere else outside the BRT corridor. The resulting origins and destinations show that the BRT system, with physical infrastructure along the black line show above, serves bus passenger demand from around the city. 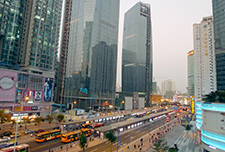 Guangzhou's innovative operational design has had a major impact on BRT planning worldwide. BRT institutions and regulation. The technical team provided critical input to the BRT institutional and regulatory arrangements and set-up, which resulted in key decisions being made correctly, and in many aspects of BRT institutions and regulation the Guangzhou BRT now provides a model of best practice for other cities to follow. Key issues included the establishment of a special BRT regulatory agency, the decision to have multiple competing BRT operators in the corridor, and the decision to pay operators per bus-km rather than per passenger, both inside and outside the BRT corridor. The institutional and regulatory work was led by Edgar Sandoval working with the technical team, with Jarko Vlasek also providing influential inputs. Long Xiaochang, Liu Changsheng and Liu Wenzhong were key counterparts in the Communications Commission and related agencies. BRT demand modelling and operational design. Karl Fjellstrom managed the survey program and built a demand model database application used in the BRT system design to define the BRT station dimensions and substops, as well as the initial BRT route selection, with key technical advice from Pedro Szasz. During the engineering design and construction stages, Remi Jeanneret working with Karl Fjellstrom and Jiao Feng (a junior engineer now with a Beijing design institute) developed a model and detailed BRT operational design. Impact analysis. The technical team planned and implemented baseline data collection that was the basis for a detailed BRT impact analysis. Public space strategy for BRT station areas. The technical team developed a public space strategy working with Gehl Architects, focusing on the Tangxia, Dongpu and Xiayuan station areas. This work was led by Hu Manying, currently an architect with the Guangdong Architectural Design Institute - Shenzhen Branch. Other areas. The technical team provided detailed input in many other areas concentrating along the BRT corridor including traffic impact analysis, surveys and data collection, budget calculations, station access and pedestrian facilities, bike lane design, parking improvements, public space design, greenways, and communications and outreach. The team made dozens of major presentations to various stakeholders during the project planning, design, and implementation, and subsequently during the BRT operation developed detailed recommendations for improving the system. Sun Yimin from the architecture faculty at the South China University of Technology said in a seminar prior to the system opening that the BRT corridor would be like a wall, severing the two sides of the corridor and obstructing north-south connections across the corridor. In fact, precisely the opposite is true. These photos of Tangxia are typical of the conditions along the corridor before and after the BRT. Before the BRT, the unsafe and infrequent pedestrian crossing conditions together with the congested and inefficient intersections meant that the corridor was much more of a severance. Together with the implementation of the BRT, dozens of safe crossings - necessary to access the BRT stations - were implemented along the corridor, and intersections were also improved. 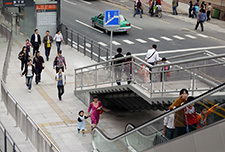 Tangxia BRT station has one bridge access (with cover and escalators), and one street level access visible in the background. In a visit by Karl Fjellstrom to Guangzhou in late 2003, he was invited by project manager Zong Yan to review proposed kerbside bus lane proposals prepared as part of a World Bank urban transport project. Mr. Fjellstrom recommended that the proposals would provide no signficant benefit, should be abandoned, and that a BRT project should be considered instead, preferably starting with a trip by senior officials to see the best BRT systems in the world in South America. Guangzhou Mayor Zhang Guangning took part in a resulting study trip to Bogota and Sao Paulo in October 2004, and was impressed with the BRT systems in those cities. When he returned, he asked the Construction Commission to assess the feasibility of BRT in Guangzhou. Meanwhile in November 2004, with some small remaining grant funding from the Rockefeller Brothers Fund and a modest grant from the Hewlett Foundation, Mr. Fjellstrom was setting up a full time ITDP office in Guangzhou. In meetings with Lu Yan, the Vice Director of the Construction Commission and Xiaomei Duan from the Guangzhou Municipal Engineering Design and Research Institute (GMEDRI), it was agreed that Mr. Fjellstrom would lead a team to prepare a BRT conceptual design and corridor comparison, and that Ms. Duan would head a team of local engineers who would all work together out of the Traffic Improvement Leading Group Office, where Guo Sheng was the vice director. In April 2005 ITDP signed an MOU with the Construction Commission to establish the Guangzhou office, and GMEDRI won a bid to work with the international technical team to prepare the BRT concept design during 2005 and into 2006. During 2005 and 2006 the key project paramaters were defined by the technical team and, over a lengthy and comprehensive review process, approved by the government. 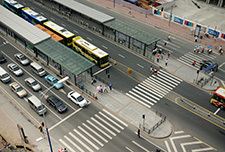 Key decisions taken during this time included the selection of Zhongshan Avenue for the BRT corridor (the other options considered were Dongfeng Road and Fangcun Avenue), as well as the endorsement of the proposed direct service operational mode in which BRT buses enter and leave the BRT corridor without passengers needing to transfer. 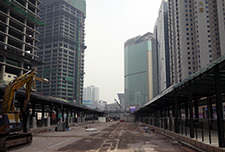 The media was given a free rein to attack the Guangzhou BRT, especially during the highly visible construction stages in 2009. The project did not progress significantly during the latter part of 2006 and 2007, with only lukewarm political support. During 2008 momentum was regained, engineering design completed, and construction started with a ceremony in front of Junjing Huayuan in Tangxia on 30 November 2008. 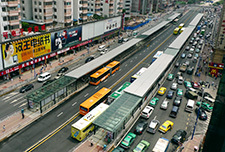 The media was given a free rein to attack the Guangzhou BRT, which had been championed by Mayor Zhang Guangning, especially during the highly visible construction stages in 2009. They took up the task with alacrity, especially the privately owned and supposedly more liberal Nanfang media group publications but also Xinkuaibao and virtually all media outlets other than the Guangzhou Daily. The project team was unauthorized to directly respond to adverse media reports even when they were unfounded, and the government never formed a team to counter what was often baseless media criticism of the project. (The media criticism vanished after the system opened, when the system was demonstrated to be extremely successful.) An example of baseless media criticism was the weeks-long criticism in the print media of the plan to remove many left turns along the BRT corridor, with left turns carried out via the road network or at u-turns, instead. These measures, though subsequently reversed at two key intersections by the traffic police to the detriment of all modes, were successful in improving speeds and capacity for both cars and BRT, and the earlier criticism in the media was proved unfounded. There has probably never been a more intensive and critical media spotlight on an urban project in Guangzhou than there was for the Guangzhou BRT. When the system opened in the early days of the Spring Festival holiday in February 2010, Guangzhou TV hosted an hours-long live coverage with inputs by a panel of experts including Xiaomei Duan. 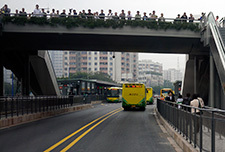 The Guangzhou BRT was probably the highest profile urban project in the city's history, with very intensive - and generally negative - media scrutiny of the project during the construction period and leading up to the opening on 10 February 2010. 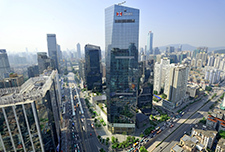 The negative coverage prior to the opening was spearheaded by the Nanfang media group and Xinkuaibao, but quickly dissipated when the project proved to be a major success. 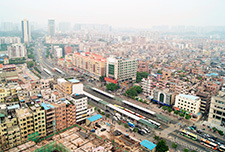 The BRT project was combined with a major renewal of the Zhongshan Avenue corridor, including a full re-paving of the roadway, and reconstruction or relocation of major utilities along the corridor. This added greatly to the project cost and unfortunately exacerbated the negative media coverage during construction, because any time there was a disturbance related to the work on utilities (there were a couple of brief localized power outages, for example) it was inevitably blamed on the BRT. Some prominent academics, including in the transportation and architecture fields from the South China University of Technology and Sun Yat-sen University, were vocally opposed to the project, saying that the system would not work and that key stations would not perform. Yu Zhi, director of the ITS Research Center at Zhongshan (Sun Yat-sen) University, sent a formal 11-page letter to the city government a few weeks before the system opened, warning that Shidajida station would become oversaturated, citing microsimulation analysis. In a meeting called to review this analysis, Mr. Fjellstrom assured the Communications Commission that there were no issues with oversaturation at Shidajida Station, and that Tangxia station was more of a concern. This was correct, and there have never been saturation problems at Shidajida station. 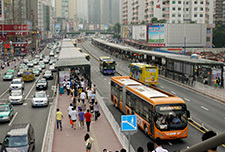 The Guangzhou Planning Bureau, with support from a World Bank funded master plan by MVA on public transport in Guangzhou which had no provision for BRT and instead proposed dozens of transfer terminals where bus passengers would be forced to transfer, was strongly opposed to the Guangzhou BRT planning, design and implementation from the earliest planning in late 2004 through to the commencement of operation in 2010. 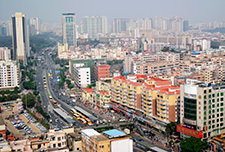 The World Bank's $200 million loan for urban transport projects in Guangzhou was approved in May 1998 and focused on funding an elevated inner ring road to temporarily benefit a small minority using cars and provide a lasting blight on large swathes of the city, including in central historical areas. As in all such projects, however, it was necessary to provide some token gestures to public transport, and in Guangzhou this included a study trip for officials to visit South America. This trip was carried out in October 2004, and when it resulted in interest in BRT, the World Bank responded by suppporting the BRT planning doing nothing to support the BRT planning. Instead, the World Bank funded a major public transport master plan by MVA under the Planning Bureau, completed in 2006, which did not propose any BRT corridors. The World Bank project under Zong Yan declined several requests and opportunities to support the early BRT project planning, and provided no role or input whatsoever in the Guangzhou BRT planning and design. When Shomik Mehndiratta took over as project manager there was no change, in that the World Bank project continued to do nothing to support the technical or policy work on the BRT design and planning in Guangzhou. Incredibly, all of this did not prevent the World Bank from subsequently seeking to take credit for the project. It can be observed that their failure to support the BRT planning in Guangzhou was a historic missed opportunity for the Bank. Instead of the highly innovative and successful Guangzhou BRT, the World Bank's first BRT project in Asia would have to wait until the disastrous Hanoi BRT, which opened in January 2017. 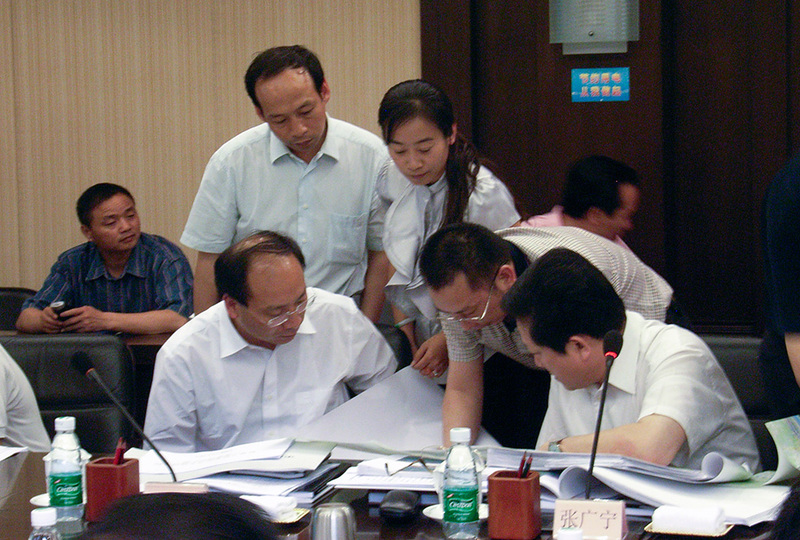 Xiaomei Duan helps explain why the BRT should be located in a central rather than kerbside location to Guangzhou Mayor Zhang Guangning (seated right) and City Secretary Chen Rugui (seated left) in May 2009. The Planning Bureau was proposing kerbside BRT lanes in the central area. It was decided at this meeting to proceed with central bus lanes. The Guangzhou Communications Commission deserve great credit for the institutional set-up and mobilization of the BRT operations. However, they got off to a slow start, taking very little action until around four months prior to the system opening. They then worked virtually around the clock to ensure a successful BRT implementation. 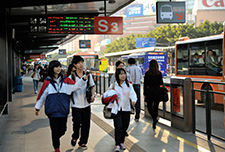 Involvement in the Guangzhou BRT proved a path for promotion for many officials. One senior official, for example, was Chen Rugui. 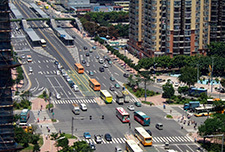 As the City Secretary, Chen endorsed the proposed BRT corridor selection along Zhongshan Avenue as well as the proposed 'direct service' BRT operational mode, overruling other officials who preferred a less sensitive suburban location or a more traditional trunk-feeder BRT operational mode. On 22 August 2017, Chen Rugui was elected Mayor of Shenzhen. The leading Planning Bureau official (a vice director) who opposed the BRT project throughout, on the other hand, has been demoted out of the Planning Bureau and into a position at a design institute. 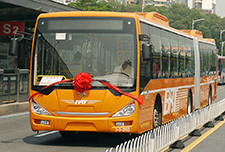 Involvement in the Guangzhou BRT proved a path for promotion for many officials. The Guangzhou City Government deserves enormous credit for sticking by the technical recommendations of the expert team working on the project. 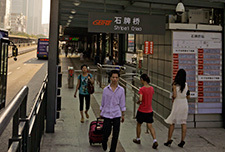 Many aspects of the Guangzhou BRT were unprecedented. 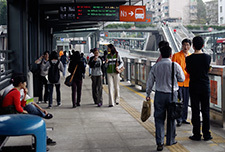 The passenger demand and throughput levels were more than triple any other BRT system in Asia. The bus throughput exceeded 300 buses per hour in a single direction in the peak hour; an average of more than one bus every 12 seconds. The highest demand BRT stations have more than 8,000 boarding passengers per hour. A very high capacity BRT system, with more than 15,000 passengers per hour in a single direction past the peak point, had never been implemented with a direct service operational mode. Now uncontroversial and becoming the predominant approach in BRT planning, many experts prior to Guangzhou's opening insisted that it was not viable for very high demand levels. 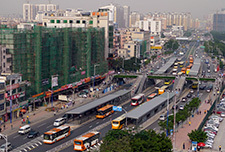 In terms of the corridor location, the safest and least controversial approach would have been to implement the BRT in suburban location where few people would notice, but the government followed the technical team's recommendations and chose to implement the BRT where the benefits would be greatest, along Zhongshan Avenue and in the central area. Another area where the government made a bold and far-sighted correct decision was to follow the technical team's recommendations for multiple BRT operators, rather than a single BRT operator. The Guangzhou BRT is still the only BRT system in China with multiple operators. 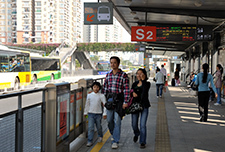 Before Guangzhou, BRT in China had featured some high-profile mediocre or failed BRT projects, damaging the reputation of BRT and providing ammunition to project opponents claiming that the proposed Guangzhou BRT was not viable. 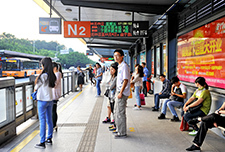 Mediocre and generally poorly-received BRT systems implemented before the Guangzhou BRT included those in Beijing (opened 2004), Hangzhou (2006), Dalian (2008), Jinan (2008), and Chongqing (2008). 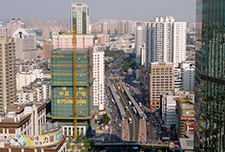 Of the systems in China that opened prior to Guangzhou, only Xiamen (opened 2008) can be considered a major success. Media criticism during the Guangzhou BRT construction stages often cited the negative experience with BRT in these cities. There is little room for error in a BRT project. In Guangzhou's case, with such high bus and traffic volumes and such a central location, it was essential that all the key pieces of the BRT jigsaw puzzle fell into place. This was achieved. Wang Yang, then Party Secretary of Guangdong Province, visited the BRT shortly after the opening, without informing officials and only with his personal secretary. Good things are a long time coming. We trust after you carefully polish, the benefits of BRT will show. Wang Yang endorsed the BRT system and exhorted officials to ensure that the system provides benefits. 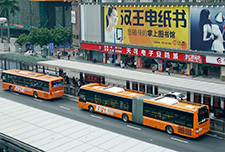 The Guangzhou BRT has been featured prominently in journals and other publications. The Guangzhou BRT won the Sustainable Transport Award in 2011, the UNFCCC Lighthouse Award in 2011, and several national awards and design prizes. 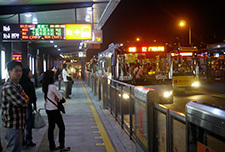 The Guangzhou BRT was the first system in Asia to be awarded a 'gold standard' rating under the BRT Standard scoring, though this has since been downgraded to silver due to issues of peak hour crowding and inadequate enforcement. The system has been covered in the New York Times and was part of a display by the Smithsonian Institution in the lobby of the United Nations Building in New York in 2010. 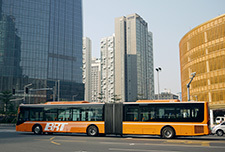 The Guangzhou BRT case study has been presented at dozens of major conferences and featured prominently in many major publications, including on the cover of Infrastructure 2011 by the Urban Land Institute, the influential Urban Transport of China journal, the Sustainable Transport magazine of ITDP, and others. One of many video features include this short feature by Streetfilms, Guangzhou, China, Winning the Future with BRT. The women on the design team collectively won the 'Women Heroes' prize of the City Government, GMEDRI won a Level 1 Design Prize from the China Engineering Design Association, the related agencies won the Guangdong Provincial Level Zhan Tianyou Prize for Innovation, and Karl Fjellstrom won the Guangzhou Friendship Award in 2011, the highest honour given by the Guangzhou City Government to foreign experts. These awards were all in recognition of work on the Guangzhou BRT. 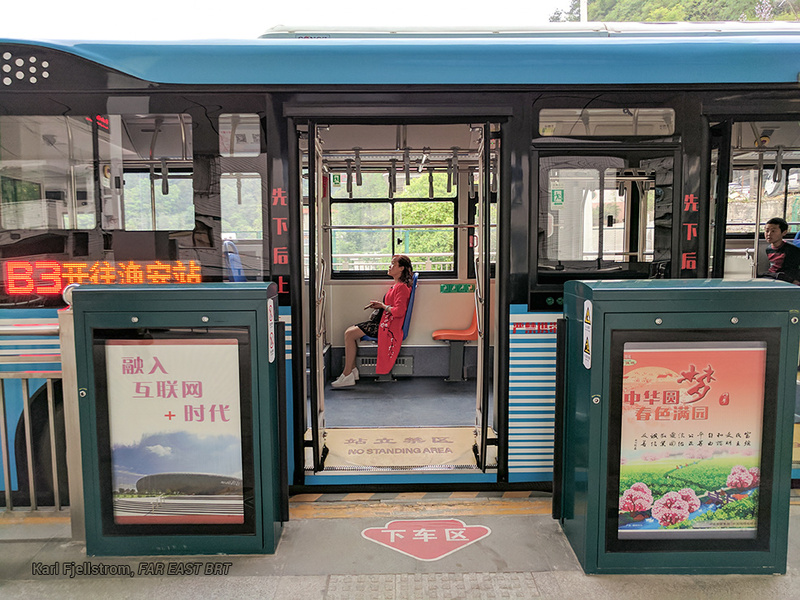 Most importantly, the Guangzhou BRT has helped inspire and embolden officials developing dozens of other BRT systems around Asia and the world, with visits by hundreds of delegations. Visits of top city officials to the Guangzhou BRT, for example, were crucial to getting final approval to proceed with the BRT projects in Lanzhou and Yichang. Guangzhou BRT design award to related agencies. Women Heroes Award to the Guangzhou BRT design team (March 2010). Sustainable Transport Award, January 2011, Washington DC. Our work on the Guangzhou BRT was far from perfect. In hindsight, we did not push sufficiently hard for physical lane dividers in the BRT corridor. The lack of physical dividers meant that the traffic police can more easily allow mixed traffic into the BRT corridor. Bike lane connectivity along the BRT corridor is poor. Bike lane connectivity must be addressed at the design stage and the design must be properly applied during the construction phase. 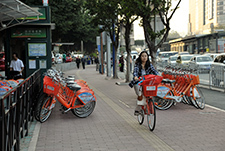 Our experience in Guangzhou and elsewhere shows that it is very difficult to retrofit continuous, well-connected bike lanes in a BRT corridor. The intersection of Keyun Avenue with the BRT corridor should have two lanes for BRT queuing, rather than one. The system needs more 18m BRT buses. Thirty-six were included in the initial implementation in 2010, and more than 8 years later, there are still only 36 18m BRT buses. In hindsight we should have done more to try to achieve a larger initial 18m BRT bus implementation, though we did not anticipate the lack of improvements over the first decade of the project's operation. Unfortunately, the story of BRT in Guangzhou so far does not have the happy ending which the excellent planning and design surely deserved. The BRT Company in charge of managing and controlling the BRT operations (another innovation by Guangzhou which provides a model for other cities) does an outstanding job and the system still benefits around 800,000 daily passenger-trips, but they have been hindered by a lack of action in key policy areas relating to the BRT since it was implemented in 2010. To take one example, the Guangzhou BRT has not added to the 18m BRT bus fleet since 2010. By this time, hundreds of 18m BRT buses should be in operation, but there are only thirty-six. Of the subsequent Guangzhou mayors since the end of Zhang Guangning's term in 2010, none have added BRT corridors or carried out serious plans. Wan Qingliang was mayor during 2010-2011 and was Party Secretary of Guangzhou up to 2014, but showed no interest in BRT. Chen Jianhua, mayor from late 2011 to early 2016, flirted with the idea but never initiated a serious phase 2 BRT study and backed down when influential figures within the city's political consultative committee opposed a plan for BRT along Guangzhou Avenue. Wen Guohui, Guangzhou mayor since January 2016, has not to our knowledge mentioned BRT or initiated any related studies. Given the high level of controversy during the BRT construction in 2009, it is understandable that mayors are reluctant to touch such a 'hot' topic, but in the meantime conditions for BRT continue to improve, as congestion steadily worsens and the potential benefits increase. The Guangzhou BRT is still the only BRT system in China with multiple operators.